The use of e-cigarettes, commonly called vaping, has been promoted by manufacturers and retailers as a safe alternative to smoking tobacco smoke. The chemical evidence backs up this claim, says the Centers for Disease Control and Prevention (CDC), but there’s more to the picture. What does this mean for people who work in vape shops? The Texas Health Services wanted to know and asked the National Institute for Occupational Safety and Health (NIOSH) to investigate. 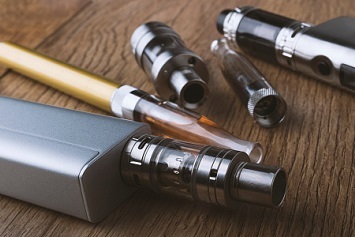 NIOSH assigned a team from its Health Hazard Evaluation (HHE) Program to evaluate employee potential exposure to vaping chemicals. In July 2016, the team visited two Texas vape shops owned by the same employer, collected air samples, took wipe samples, and interviewed employees about their work and health. The two shops had 16 employees, who themselves vaped. Generally, the team found that chemicals in the air were below occupational exposure limits, employees wore gloves while mixing custom e-liquids, nicotine was detected on surfaces throughout the shops and sometimes contacted the skin of the employees, and no employees reported symptoms of nicotine toxicity in the 4 weeks following the site visits. The team also concluded that more could be done to protect employee health. What Does a Vape Shop Do? According to the HHE team, the vape shops it visited purchased premixed e-liquids from a supplier and resold them to customers. They also hand mixed custom e-liquid blends according to customers’ tastes and nicotine, propylene glycol, and vegetable glycerin preferences. Hand mixing of e-liquids for customers was the primary function at a counter. All counter employees generally performed the same tasks each day. The employees themselves also vaped. Both shops in the study were ventilated with air-handling units. Employees reported that they cleaned floors, counters, and displays with cleaning agents, including Clorox® wipes and sprays, Pine-Sol® surface cleaner, and glass cleaners. The company provided employees with nitrile gloves for use when mixing e-liquids and when working with chemicals. The team observed that employees always wore gloves during these tasks, as required by company policy, and fresh gloves were put on with each new bottle of e-liquid that was mixed. Nonetheless, employees reported that the liquids sometimes contacted their wrists and arms and even splashed on their faces. E-liquids typically comprise propylene glycol, vegetable glycerin, nicotine, and flavoring chemicals. Formaldehyde can also be generated as a breakdown product of propylene glycol. Nicotine is the substance of most concern. The CDC notes that nicotine is highly addictive, toxic to developing fetuses, can harm adolescent brain development, and is a health danger for pregnant women. Nicotine can be absorbed into the body by inhalation, ingestion, skin contact, and through mucous membranes. Other flavoring chemicals of concern include diacetyl and 2,3-pentanedione, which have been found to contribute to serious respiratory disease and decreased lung function. Although the measured concentrations were below all applicable occupational exposure limits, the team recommended that the employer implement a policy prohibiting vaping in the workplace with e-liquids that contain diacetyl and 2,3-pentanedione. Other recommendations included repairing leaks in containers containing vaping liquids, installing trays where leaks may occur to expedite cleanup, requiring employees to immediately wash their hands after coming into contact with nicotine, and providing long-sleeved lab coats and goggles or face shields and instructing employees on their use to prevent contact with the eyes, skin, or clothing when handling the stock nicotine solution. NIOSH’s May 2018 report is at https://www.cdc.gov/niosh/hhe/reports/pdfs/2016-0120-3307.pdf.